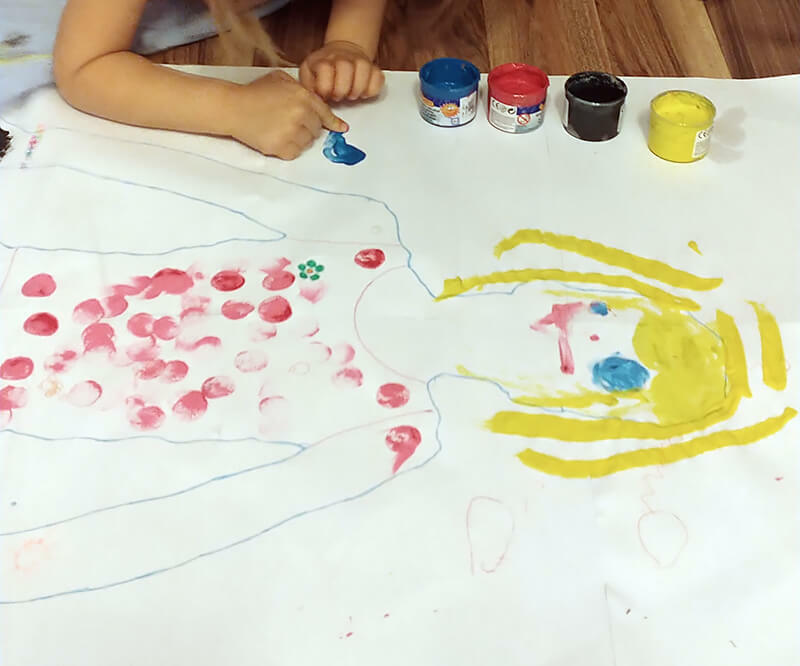 We are very happy to share with you an indoor activity that has greatly entertained and captivated our 3 and a half years old girl: a creative body tracing self portrait. 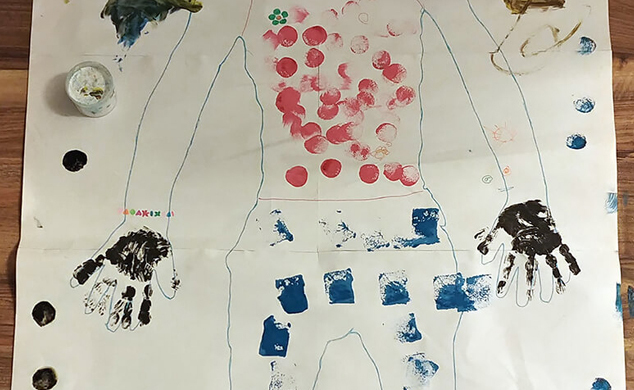 A few days back, when the weather outside was not so pleasant, we came up with an idea of an indoor activity involving painting: a body tracing self portrait of our daughter. It turned out to be engaging and fun for all of us. Paint – we used Jovi School Tempera Assorted Colors. For toddlers we recommend Jovi Finger Paint Core Colors Washable Finger Paints (these are non-toxic, easily washable and stain-free; their high-viscosity ensures less splattering and easy application). For older girls you can also use Jovi Glitter Box with Tempera Paint Assorted with Brush. Brushes – we used regular big paint brushes and some sponge brushes from this set: WFPLUS 5 Sizes Round Paint Foam Sponge Brush Set Kids Painting Tools. If you have a toddler you can use these: Crayola My First Jumbo Toddler Paint Brushes. These are great for both kids and toddlers: YallFairy Paint Sponges for Kids – Fun Learning Toys for Toddlers. Paper – we recommend using a wide paper roll, like this: Canson XL Series Mix Media Paper Roll for Wet and Dry Media, or you can just use taped regular A4 paper sheets. A cup of water – to clean your brushes. Regular graphite pen – for contouring. Place the sheet of paper on the ground, on a straight surface. Your toddler or child should be able to lay on it with his hands and feet slightly distant from the body. Then, take the graphite paper and start tracing the contour of your kid’s body. Don’t worry, it doesn’t have to come out perfectly. All that matters is having fun together! After creating the body contour, let you kid draw the contour of the clothes. If he’s a toddler, you can draw the contour of the clothes for him. Our girl wanted me to draw them for her. Now, prepare your painting utensils and let you kid enjoy painting his portrait. We started with the hair and face and then moved on to the body. Explain you kid (especially if he is a toddler) what shapes and brushes he should use for painting each element. The eyes can be made using a round sponge brush, the nose can be a fingerprint and the mouth a curved line. Let your imagination fly. Show your child and explain to him what are the colors of his hair, eyes and mouth, but let him paint them with any color he wants. Then, move to the body and paint together the clothes and accessories. Let your kid make patterns with his brushes, finger strokes, shapes and fills. Don’t apply any constraints. After coloring the body, we came up with an idea for the hands and feet. Our daughter painted the palm of her hand and added her handprints. Then, she painted her crocs’ soles and used their prints as feet in her portrait. Finally, you can leave the background of the portrait white, add various elements to it or paint it in a single color. Our girl chose her favourite round sponge brush and filled the background with dots. I hope we inspired you to create something beautiful together! Do share with us your creations!